Over the past decade, a new awareness of the relationship between conflicts and development has grown. Developmental factors can act as a trigger for violence, as well as for ending violence and for triggering post-conflict reconstruction. This book explores the complexity of the links between violent conflict (usually civil wars) and development, under-development and uneven development. It emphasizes the connections between stable developed economies and civil wars in other parts of the world, and examines how structural factors (such as the organization of the global economy) virtually condemn some regions to conflict and under-development. This valuable introductory text explains, reviews and critically evaluates this complex relationship. It focuses on intra-state conflicts and complex political emergencies that combine transnational and internal characteristics. Attention is also given to inter-state conflicts. 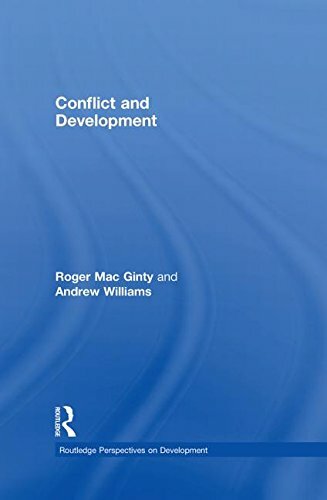 Chapters emphasize how the relationship between conflict and development traverses many scales (macro, meso and micro) and dimensions (economic, political and cultural). Furthermore it explains how different developmental challenges and opportunities emerge along the full life-cycle of conflict. Specifically, the role of poverty, state, market, civil society, globalization, humanitarian aid, refuges, gender and health within conflict dynamics are examined. The book also investigates specific developmental issues emerging during conflict management and post conflict reconstruction. Both authors have a background in conducting research in deeply divided societies, and argue that many of the processes connected with war and peace making deliberately write people out of the equation. This book attempts to ‘write people in’. By drawing on contemporary theoretical debates and examining current policies and events, the text unpacks the difficult and complex aspects of the relationships between armed conflict and development and makes them accessible, interesting and policy relevant. It considers how peace making, peace building, and post-war reconstruction are usually more sustainable and successful if politicians, policy makers, entrepreneurs and those working for international NGOs take on board local opinion and capacity. Written in an accessible style, the book considers the main contemporary theories and arguments on conflict, development and the interactions between the two. The text is illuminated throughout with case studies drawn from Africa, the Balkans, Asia and the Middle East.